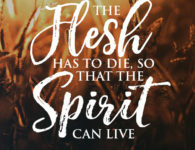 This is one of the most popular tag lines on t-shirts and Christian designs. But the fact is that these three words from 1 Corinthians 13:13 are extremely powerful. By Faith, we are Saved. Because of our confidence in our Salvation, we have Hope. Without it, we are hopeless. And the greatest of these: Love. Jesus said “Love one another as I have loved you.” It is our love for one another. Not just our family. Not just our church family. But also our love for those outside of our comfort zone. Christ showed love for people outside of the circle of the Apostles. Christ showed Love in everything he demonstrated on this earth. The greatest is Love because it is a demonstration that we are conforming to the image of Christ.